Kevin Greenspon’s history as a mindful and concise composer of graceful ambient compositions for guitar, synthesizer and cassette tape reach for new horizons on his first release in two years. “To Leave A Mark” stitches the ethereal atmosphere of previous work with rhythmic elements of techno, noise and pop music. Each piece melts specific personal experiences into abstract pools, coaxing a state of self-reflection. 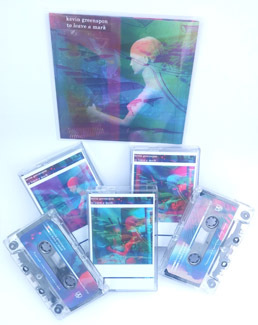 First edition of 200 chrome cassettes dubbed in real-time with full-color labels and doublesided printing on heavyweight gloss stock. Second edition of 250 pro-duplicated and shrinkwrapped chrome cassettes. Stamped CDr housed in full-color sleeve.